Calcium is the cation that is deposited along with carbonate ions as the coral forms a skeleton. 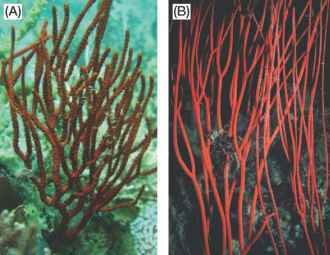 If 45Ca2+ (a radioactive isotope of Ca2+) is mixed into the water surrounding a coral, it immediately gets taken up by the coral as calcification occurs. By measuring the ratio of radioactive atoms to non-radioactive atoms of Ca2+, the rate at which all Ca2+ atoms are deposited can be calculated. This technique is very precise and can yield an accurate measure of the rate of calcification of corals. The downside of this technique, however, is that it must be done in the laboratory, is potentially hazardous if the right precautions are not taken, and may not accurately depict calcification as it might occur on a coral reef (due to its requirements for lab conditions).